Today more than ever, content marketing is important to business. Lets explore why. As millennial professionals continue to influence market trends, consumer culture and marketing strategy has undergone a drastic change. With seemingly endless options for goods and services, content marketing has become the new frontier for finding targeted audiences and new customers, getting their attention, and keeping it. 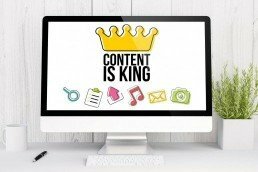 So why is content marketing important for your business? A successful marketing campaign aims to cultivate loyalty, and content marketing is a key piece of campaign strategy. Then, customers and clients will return again, spread the word through social media platforms, and help build the brand. So the question is, how do we generate new traffic to our website, widen our influence, and promote customer loyalty? Simple. We offer them something valuable, even before before any purchase is made. Enter stage left: Content Marketing. Content Marketing is important to business because it builds your online reputation. Let’s take a closer look. Content marketing aims to provide viewers with valuable content, such as blog posts, videos, infographics, presentations, social media posts, and even memes. By offering value, you’ve already enticed your viewer and begun to build brand trust. More importantly, you’ve offered them a sense of delight or discovery. Value can mean many things to many different types of audiences, which is why it’s important to know exactly who your campaign is speaking to. Perhaps you need to reach information-hungry millenials who crave instant, shareable content that’s humorous, inspirational, or just plain helpful. Perhaps you need to reach professionals with a desire for deeper knowledge who prefer videos or presentations. No matter who you’re targeting, one thing is for sure: you need to give your viewers something valuable. This concept of offering something to a viewer before they’ve even clicked “buy” or “register” lies at the heart of new inbound marketing strategies. After all, using the old way of demanding business from new clients with aggressive call-to-action statements (“Buy today!”) just doesn’t work any longer. In fact, if that’s the first impression your viewers get online, you’re likely to appear desperate and scare them away. Why should the discerning shoppers of today trust your company? How can they know if you’re a credible and reliable supplier? It’s transmitted in your content marketing! Any company can express their desire for new business, but few can offer a true sense of value in today’s digital space. (Its trickier to communicate value in today’s anonymous digital space) By enticing viewers with relevant, quality content, you’ve already demonstrated your ability to make their lives better. Whether you’ve made them smile, instilled joy, or inspired them to think differently, leading with generosity in your marketing strategy will lead to more engagement, and sales. It also builds an authentic sense of your brand’s personality and encourages viewers to “buy-in” to what your organization stands for. So you can see that content marketing is important to business, especially today! If you’re not sure how to get started with your inbound or content marketing strategy, here’s one simple hack you can use today to get on your way!